This time we leave the shores of the mainland UK far behind and are transported 51 degrees south to the Falkland Islands, an outcrop of islands off the coast of South America which have made worldwide headlines, but which we still know very little about. Central to the series is th e Reverend Richard Hines who ministers from the Anglican Cathedral in Stanley to this small, close-knit community. As minister to the largest Anglican parish in the southern hemisphere, the Reverend Richard spends much of his time flying in small planes to visit his flock around this windswept archipelago and even, on occasion, travelling as far as South Georgia. 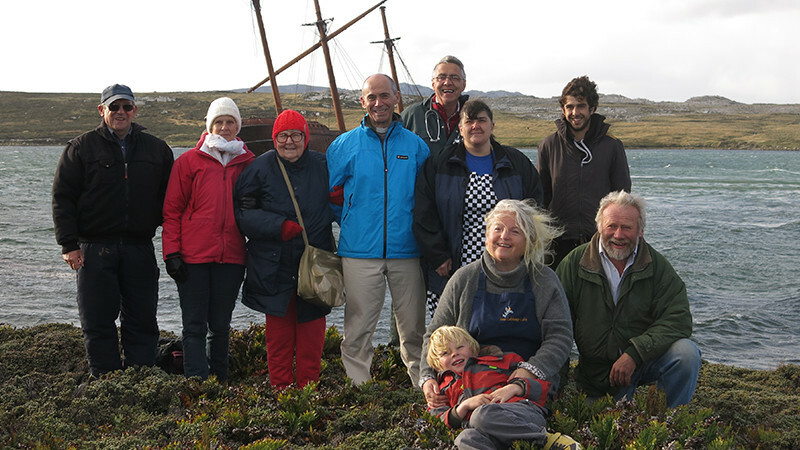 This series starts, during the Advent season, but instead of preparing for snow and ice, the islanders dust down their barbeques as family members return to the islands for the Festive Season. Summer also means the penguin and albatross chicks are hatching and the Elephant seals are searching for their mates. Viewers will also meet Her Majesty’s representative on the island The Governor, Nigel Haywood, a keen fisherman and butterfly collector, the military padres on the British Armed Forces base and Sammy Hirtle and her sheep shearing team who are sharpening up to attempt to win top spot in the world championships. There’s also 72 year old Ron Binnie, legendary jockey of the Falklands who’ll be riding in the Maiden’s Cup on Boxing Day and the locals will be battling it out in the annual raft race in Stanley harbour.